The Motorola Talkabout MT350R is a great waterproof walkie talkie that will fit your outdoors lifestyle. It’s robust design can take a knock or two, and we reckon this walkie talkie would be perfect for hiking trips, climbing trips, and even skiing as the bright orange design makes the walkie talkie easy to spot if you drop it by accident, especially in the snow. 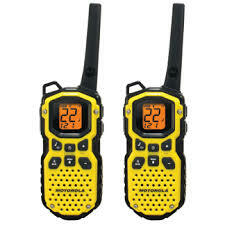 The walkie talkie features only a few big backlit buttons, making this walkie talkie especially simple to use. The MT350R is splash and dust free, and will certainly survive most kinds of weather including storms, whether rain or snow. We have also heard reports about the unit being able to float, although we have not been brave enough to put these rumors to the test! 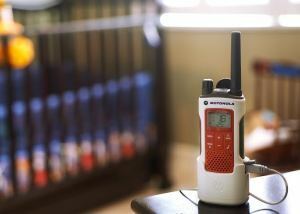 With added weather channels and alert functions, the MT350R is the ideal walkie talkie to take with you on long trips. It has one of the largest battery life spans that we have come across, where a full charge of the batteries should last up to 3 days under normal use. We consider this walkie talkie not only great, we think it’s a necessity. The only thing we would improve upon it is that we would have ideally liked it to be slightly smaller, and to have the option to use alkaline batteries as a backup battery option, something that the slightly improved Motorola Talkabout MT352T does have. The transmission range of the Motorola Talkabout MT350R is advertised as 35 miles under ideal circumstances. It should be noted that while, as with all walkie talkies, the range falls off depending on factors like terrain, weather and other interferences, the range of this walkie talkie holds up very well. We have found while hiking on a hill that we had no problems communicating with our base camp over 12 miles away. We have heard other people mention that they got a range of around 2 miles even in cities, where there are lots of disturbances. 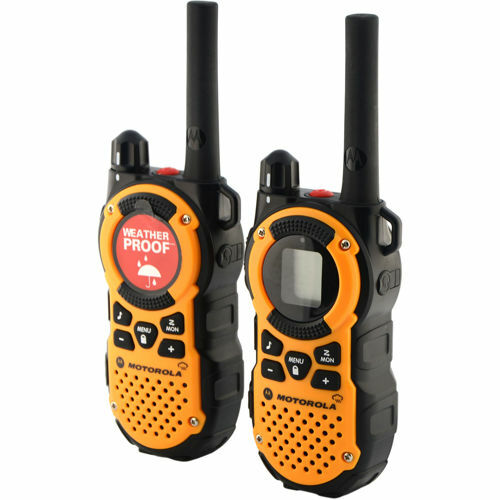 The MT350R has PPT adjustable power buttons meaning the walkie talkie can operate using high or low power transmissions. 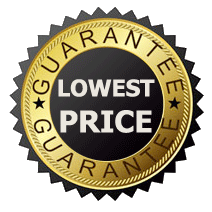 We would generally recommend using the handset in low power transmission first so it’s battery life is longer, and when a longer range is required to switch to it’s high powered setting. Along with the PPT adjustable power settings, the MT350T has even more features that make this walkie talkie incredibly energy efficient. When you’re not using it, and the radio scan does not detect anyone else using your channel it goes into idle mode after 2 minutes of silence. In this idle mode, the walkie talkie only uses 0.5 Watt. Even under constant use though, the MT350T and it’s high capacity NiMH battery offers twice the power of a standard rechargable battery pack and should give enough power for up to 15 hours. 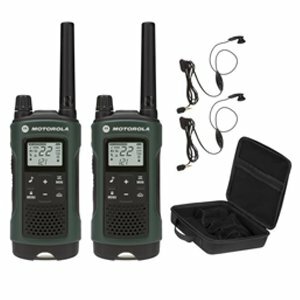 As mentioned before, we highly recommend this waterproof walkie talkie for long hikes, skiing trips and camping. The MT350R comes with NOAA weather channels, and alert functions. Nobody likes to get caught out in an unexpected storm, and Motorola has certainly thought of this. The MT350R also comes with handy tolls included, such as the emergency LED flashlight function. Functions like this really don’t seem that important on the first inspection, but it’s in the moments where you don’t have them that you wish you had. Another way to use the MT350R very well is to take it on hunting trips. The MT250T comes with the iVOX feature which offers hands free communication. The radio will automatically transmit when you speak in the microphone, which leaves your hands free. Another great feature this walkie talkie has is VibraCall. VibraCall gives a silent ringer vibration instead of having a ringing sound. The silent ringer is ideal in situations where sound could be intrusive, like when hunting, or at music concerts. Amongst the other features the Motorola Talkabout 350R has are a keypad lock, and a MON function. The keypad lock is ideal to avoid ‘pocket dials’ but also serves as a child lock. Especially useful for those little hands that are a little too curious. The MON feature scans your channel and lets you know if there are others using your channels and security codes. Incredibly useful, both for trying to find an empty channel for your party, or looking to find anyone for a distress call. 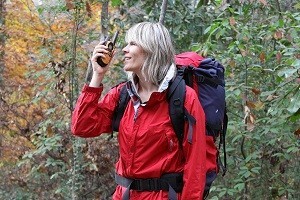 The Motorola Talkabout MT350R is a waterproof walkie talkie that’s built specifically for long duration outdoor use. It’s robust, and dust and splash resistant making it perfect for long hikes, camping or skiing trips. The walkie talkie is packed with features to make our lives easier and it’s battery life is incredible. This walkie talkie is featured in our top 5.